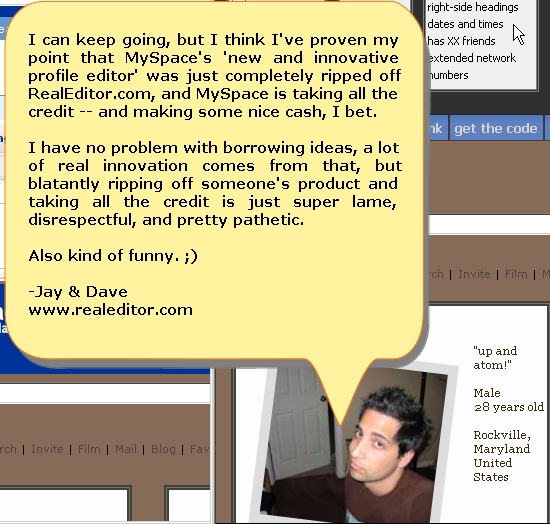 RealEditor Says "MySpace Ripped Us Off"
RealEditor is a MySpace profile editor that was created by Jay Elaraj and Dave Maestri, two Freewebs developers, in their leisure time. It caught the eye of MySpace President Tom Anderson, who wrote to the founders in March. He complimented RealEditor and asked them if they’d be willing to come work for and/or sell the software to MySpace. The co-founders declined. But they had a bit of a surprise recently when MySpace released it’s new editor, incorporating many of the features from RealEditor and some of the look and feel. They created a video here which shows some of the similarities. I can keep going, but I think I’ve proven my point that MySpace’s ‘new and innovative profile editor’ was just completely ripped off RealEditor.com, and MySpace is taking all the credit — and making some nice cash, I bet. I have no problem with borrowing ideas, a lot of real innovation comes from that, but blatantly ripping off someone’s product and taking all the credit is just super lame, disrespectful, and pretty pathetic. If it were me, I would have sold the editor to MySpace when they offered to buy it. There isn’t a close enough case for this to be worth litigation, and the traffic bump from calling MySpace out on this will be short lived.